Whether you are looking for a place to fish, picnic, launch your kayak or just enjoy some gorgeous lake views, Shutes Branch Recreation Area is a great choice. 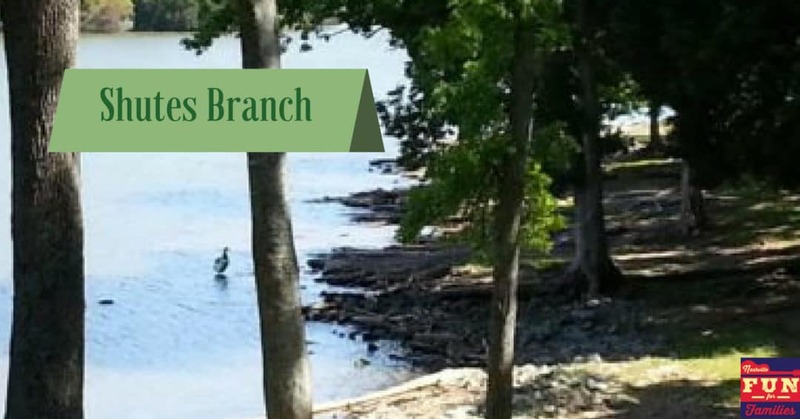 Located in Old Hickory, Tennessee, Shutes Branch is situated right on Old Hickory Lake. There is a large boat launch spot on either side of the grassy, wooded picnic area. There is lots of parking in all three places so finding a spot for your boat trailer should not be a problem. The shoreline is a bit rocky so make sure your little ones wear shoes if they decide to wade in. Swimming is not prohibited at Shutes Branch but there isn’t a beach area set aside. There are plenty of shallow spots to get your feet wet while looking for turtles and ducks though. There are 14 separate areas with tables and grills. All of these are located in shady spots and have awesome view of the lake. There is one large covered picnic shelter at Shutes Branch. It has electric hookups and is large enough to accommodate up to 50 people. It can be reserved. Shutes Branch does have a bathroom facility. They were clean and stocked on the day of our visit. If you love mountain biking, then be sure to check out the Shutes Branch Mountain Biking Trail. Bikers of all skills levels will enjoy the Shutes Branch Mountain Biking Trail, accessed from the picnic area. The first part of the trail is ideal for beginners, while the second portion will challenge more experienced cyclists with rockier terrain, ledges and tight turns. More information about the trail can be found at this link. I have seen dogs there before so yes, I think they are allowed.